I thought I’d add a page to display the cool things that I’ve been nominated for . . . and then I realised that I haven’t actually been nominated for anything . . . yet. But keep your eyes open because there may be one or two award nominations that crop up. Fingers crossed, kids. And hey, don’t forget to vote for Some Day And Never in the People’s Choice Award section of this competition. Monday 8 April 2013: I was honoured to have been nominated by author Maria Savva as one of her fifteen recipients of the Very Inspiring Bloggers Award. As a recipient, I get to display a cool badge. I was also required to write a short post in accordance with the ‘rules’ of the award. I cheated a lil bit. The badge and the link to that article are below. 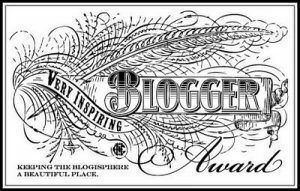 Read the post: The Very Inspiring Blogger Award. 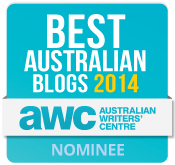 Friday 7 March 2014: I thought I was lucky last year to have been nominated, so you can imagine that I am beyond thrilled to have been nominated in the 2014 Best Australian Blogs award. And, just like last year, I get to display a funky lil badge to show you that I am a nominee. When the voting for People’s Choice goes live, I’ll let you know. AMAZEBALLS! Just seeing this now! Great Job!